Lu Xun (Traditional Chinese: 魯迅; Simplified Chinese: 鲁迅; pinyin: Lǔ Xùn) or Lu Hsün (Wade-Giles), pen name of Zhou Shuren (Traditional Chinese: 周樹人; Simplified Chinese: 周树人; Hanyu Pinyin: Zhōu Shùrén; Wade-Giles: Chou Shu-jen) (September 25, 1881 – October 19, 1936) was one of the major Chinese writers of the twentieth century. Considered the founder of modern baihua (白話, Chinese vernacular) literature, Lu Xun was a short story writer, editor, translator, critic, and essayist. He was one of the founders of the China League of Left-Wing Writers in Shanghai. Lu Xun was born into a scholar family during the Qing dynasty, but was exposed at a young age to the poverty and suffering of Chinese peasants in the countryside. He went to Japan on a scholarship to study medicine, but quickly realized that he could make the greatest impact on the Chinese people through writing. Lu Xun’s original works were mostly satirical criticisms of Confucianism and feudalism, and reflections on the past. His most famous story is A Q Zhengzhuan (阿Q正傳; "The True Story of Ah Q"), published in 1923. He wrote in a clear, lucid style which was to influence many later generations of Chinese writers. 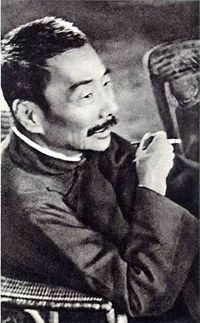 Lu Xun exerted a substantial influence after the May Fourth Movement and was lionized by the Communist regime after 1949; Mao Zedong was a lifelong admirer of Lu Xun's works. Lu Xun himself never joined the Chinese Communist Party despite the staunch socialism professed in his works. Lu Xun was born as Zhou Zhangshu, on September 25, 1881, in Shaoxing, Zhejiang province. He was later renamed Shùrén (樹人; "to nurture a person"). He was the eldest of four brothers; his younger brother Zhou Zuoren, four years his junior, became a notable writer in his own right. The Shaoxing Zhou family was very well-educated, and his paternal grandfather, Zhou Fuqing (周福清), was an official in the Qing imperial bureaucracy and held posts in the Hanlin Academy; Zhou's mother, née Lu, taught herself to read. His father, Zhou Boyi, was a scholar. Young Zhou Shuren was brought up by an elderly servant, Ah Chang, whom he called Chang Ma; one of Lu Xun's favorite childhood books was the Classic of Mountains and Seas. After Zhou Fuqing was accused of using bribery to try to procure an office for his son, Zhou Boyi, the family fortunes declined. Zhou Fuqing was arrested, almost beheaded, and imprisoned. At the age of thirteen, Lu Xun went with his mother to his grandmother’s home in the countryside near Shaoxing. There he saw first-hand the oppression and suffering of Chinese peasant families, a theme which appeared in many of his later works. His father's chronic illness and eventual death when Lu Xun was sixteen, apparently from alcoholism, later inspired him to study medicine. His father’s death left the family impoverished. In 1898, Lu Xun entered Jiangnan Naval Academy (江南水師學堂), which did not charge tuition. Later, he transferred to the School of Mines and Railways (礦路學堂) at Jiangnan Military Academy (江南陸師學堂). It was there that Lu Xun had his first contacts with Western learning, especially the sciences; he studied some German and English, reading, among some translated books, Huxley's Evolution and Ethics, J. S. Mill's On Liberty, as well as novels like Ivanhoe and Uncle Tom's Cabin. This exposure to Western concepts of democracy, science, and capitalism influenced him to join the struggle against imperialism and feudalism. Lu Xun left for Japan in 1902, on a Qing government scholarship. He first attended the Kobun Gakuin (Hongwen xueyuan, 弘文學院), a preparatory language school for Chinese students attending Japanese universities. His earliest essays, written in Classical Chinese, date from here. Lu also practiced some jujutsu. Distrusting traditional Chinese medicine (which had failed to cure his father), he decided to pursue a Western medical degree at Sendai Medical Specialty School (now medical school of Tohoku University) in Sendai, Japan, in 1904. Lu Xun returned home briefly in 1903, and at the age of twenty-two, entered into a marriage with a girl from the local gentry, Zhu An (朱安). Zhu, illiterate and with bound feet, was handpicked by his mother. Lu Xun possibly never consummated this marriage, although he took care of her material needs all his life. In 1904, Lu Xun joined the Revive China Society (Guangfuhui, or Kuang Fu Hui) and joined other Chinese students in Japan in a movement to overthrow the Qing dynasty. In 1906, Lu Xun decided to transfer from medical studies to literature. In the Preface to Nahan, his first story collection, he revealed why he gave up pursuing a medical career. One day after class, one of his Japanese instructors screened a lantern slide documenting the imminent execution of an alleged Chinese spy during the Russo-Japanese War, 1904-05. Lu Xun was shocked by the apathy of the Chinese onlookers; he decided it was more important to cure his compatriots' spiritual ills rather their physical diseases. At the time, I hadn't seen any of my fellow Chinese in a long time, but one day some of them showed up in a slide. One, with his hands tied behind him, was in the middle of the picture; the others were gathered around him. Physically, they were as strong and healthy as anyone could ask, but their expressions revealed all too clearly that spiritually they were calloused and numb. According to the caption, the Chinese whose hands were bound had been spying on the Japanese military for the Russians. He was about to be decapitated as a "public example." The other Chinese gathered around him had come to enjoy the spectacle. While studying in Japan, Lu Xun wrote several essays on the natural sciences and world literature, and translated patriotic works from other oppressed countries. In 1909, he published these stories as Stories from Other Lands, with some of the translation done by his brother, Zhou Zuoren. In the summer of that year, Lu Xun returned to China and taught at the Zhejiang Normal School. He then became dean and later principal of the Shaoxing Middle School. After the overthrow of the Qing dynasty in the Revolution of 1911, Lu Xun wrote an essay in classical Chinese, Remembering the Past. In 1912, when the Republic established its provisional government, he became a member of the Ministry of Education. He moved to Beijing with the republican government, but quickly became disillusioned by the government’s inability to control warlordism. The October Revolution in Russia in 1917 introduced Luxun to the ideas of Marxism and Leninism. In May 1918, Lu Xun published the first major baihua (Chinese vernacular) short story, Kuangren Riji (狂人日記, "A Madman's Diary"), using his pen name for the first time. He chose the surname Lu because it was his mother's maiden family name. Partly inspired by the Gogol short story, "Diary" was a scathing criticism of outdated Chinese traditions and Confucian feudalism which was metaphorically "gnawing" at the Chinese like cannibalism. Between 1918 and 1924, Lu Xun produced twenty-five short stories, published as Wandering and Call to Arms. His use of the vernacular grew out of the May Fourth Movement of 1919, in which Chinese intellectuals strove to break free of the restrictions of stylized, classical Chinese literature and create a new literature using traditional Chinese characters to write in the language of ordinary Chinese people. From 1918 until 1927, Lu Xun taught at Beijing University, Beijing Girls’ Normal College, Xiamen University, and Sun Yat Sen University in Guangzhou (Canton), and continued to produce short stories. In 1927, Chiang Kai Shek ordered the massacre of Chinese Communists in Shanghai and other cities. Some of Lu Xun’s students at Sun Yat Sen University were arrested and executed. Unable to save them, Lu Xun resigned his teaching post in protest and moved to Shanghai, where he lived until his death. In Shanghai, Lu Xun studied Marxist-Leninist thought and joined the Chinese Communist revolution. In 1930, he became a founder of the China Freedom League and the China League of Left-Wing Writers, a movement subscribing to socialist realism, the idea that art should portray contemporary events and social problems as they really are, in order to give hope for a better society in the future. In 1933, Lu Xun participated in the founding of the China league for Civil Rights, along with Soong Qingling, the widow of Sun Yat Sen, and other activists. He helped organize an International Anti-Imperialist, Anti-Fascist Conference in Shanghai and presided as honorary chairman. Lu Xun died in Shanghai on October 19, 1936. His remains were interred in a mausoleum within Lu Xun Park in Shanghai, where a Lu Xun Museum exists today. Lu Xun’s complete works, numbering over nine hundred, have been published in several editions. The 1981 edition includes not only fiction and essays, but letters, diaries, and prefaces and postscripts to ancient books and translations. Lu Xun’s original works were mostly satirical criticisms of Confucianism and feudalism, and reflections on the past. His most famous story, A Q Zhengzhuan ( 阿Q正傳; "The True Story of Ah Q"), published in 1923, was a satire about a man named Ah Q, who represented the Chinese bureaucrats administering the Republic of China and who ended up as failures. Between 1918 and 1924, Lu Xun produced twenty-five short stories, published as Wandering (Pang Huang; 彷徨; 1926) and Call to Arms. From 1924 to 1926, Lu wrote essays of ironic reminiscences, published in 1928 as Zhaohua Xishi (朝花夕拾, Dawn Dew-light Collected at Dusk), as well as the collection of prose poems, Ye Cao (野草, Wild Grass, published 1927). During his lifetime, Lu Xun contributed significantly to every modern literary genre except the novel. He wrote in a clear, lucid style which was to influence many later generations of Chinese writers. Lu Xun's translations were important in a time when Western literature was seldom read in China, and his literary criticisms remain acute and persuasively argued. Zhongguo Xiaoshuo Lueshi (中國小說略史, A Concise History of Chinese Fiction) was written in 1924, revised and published in 1930, and translated into English in 1959. A comprehensive overview of history of Chinese fiction, drawn from his lectures as at Peking University, it was the first work of its kind in China. It covered Chinese fiction from ancient myths and legends through the early modern fiction of the Qing dynasty. Other important works include volumes of translations, notably from Russian. He particularly admired Nikolai Gogol and made a translation of Dead Souls; the title of his own first story was inspired by a work of Gogol. He also produced discursive writings like Re Feng (热风, Hot Wind), and around twenty other volumes of other works such as prose essays. Lu Xun's style could be described wry and ironic. His essays are often incisive in their social commentary. In translation, it is difficult to convey his mastery of the vernacular language and the tone of some of his literary works, like The True Story of Ah Q. He frequently treads a fine line between criticizing the follies of his characters and sympathizing with those follies. His stories remain popular with modern readers in many languages. Because of his leftist leanings, and the role his works played in the subsequent history of the People's Republic of China, Lu Xun's works were banned in Taiwan until late 1980s. Lu Xun's works also appear in high school textbooks in Japan. He is known to Japanese by the name Rojin (ロジン in Katakana or 魯迅 in Kanji). Lu Xun was also the editor of several left-wing magazines such as New Youth (新青年, Xin Qingnian) and Sprouts (萌芽, Meng Ya). He was the brother of another important Chinese political figure and essayist Zhou Zuoren. He was among the early supporters of the Esperanto movement in China. ↑ Shuren Zhou and William A. Lyell, A Lu Xun Reader (New Haven: Far Eastern Publications, Yale University, 1967), 23. A Brief Biography of Lu Xun with Pictures. Selected Stories of Lu Hsun. Bibliography. An Outsider's Chats about Written Language, a long essay by Lu Xun on the difficulties of Chinese characters. This page was last modified on 2 August 2018, at 15:32.